Ecclesiastes is a wisdom book. Someone who calls them self the Preacher has inspirational thoughts that are shared with the reader. Nothing about these thoughts indicate it is from anything more than human knowledge. Chapter eleven opens with the suggestion that it is not good to be too cautious. There are many things that are unknown but many things are known as well. If the clouds look dark it is likely to rain, if a tree falls, it lays where it falls, but if you don’t plant because of the wind, or don’t harvest because it looks like rain there will be no crops. So don’t wait for the perfect day, perfect time, forge ahead. 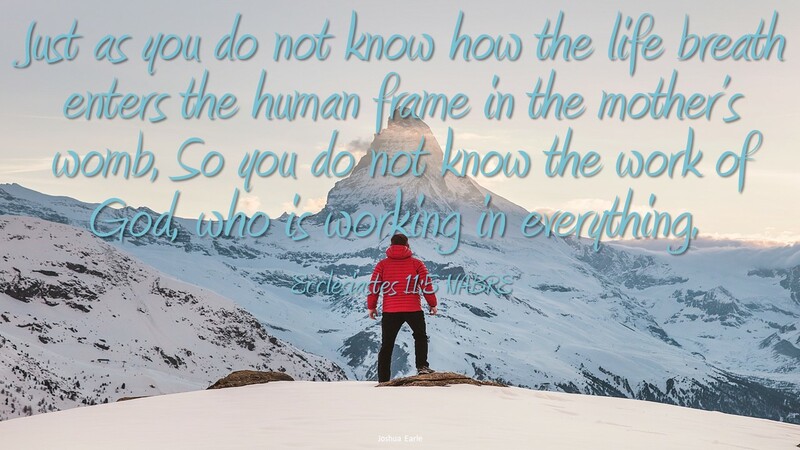 Just as we don’t know how life is breathed into a baby in its mother’s womb and we don’t understand all that God does, we do know God is working in everything. If we know God is at work we can trust that God wants our good always and everywhere. So don’t be cautious in your endeavors, take risks, and try to push forward in all you want to fulfill in your life. A wise person uses the resources at hand to accomplish much. A disciple depends on God to be with them and to provide a helping hand in their plans, even if they don’t know how God will help. Don’t let anything hold you back. If you see a business opportunity you have been thinking about give it a try, is there someone special in your life you think you would love to spend your life with, forge ahead, if there is some way to help in your church, help. There is no need to be overly risky, but as the saying goes, with great risk comes great reward. What have you been hesitating to try? What would it require for you to be less cautious?